JANUARY 2014 • FOODSERVICE EQUIPMENT & SUPPLIES • 13 vulcanequipment.com/powerfr y Done To PerfecTion. © 2014 Vulcan INCREASE YOUR FRIES PER HOUR. The PowerFry™ VK Series delivers more fried food in less time. Plus dramatic energy savings. Take it for a test fry and see for yourself. 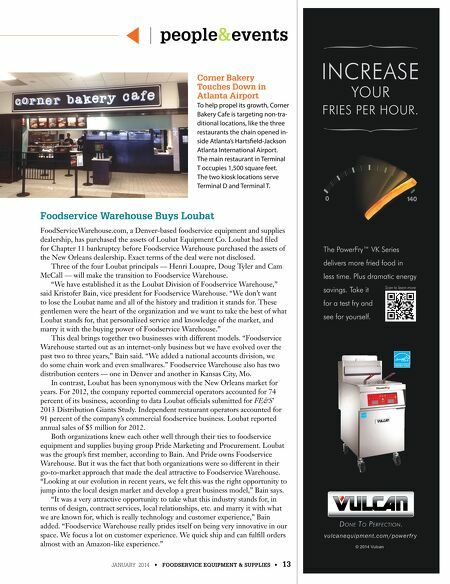 Scan to learn more Foodservice Warehouse Buys Loubat FoodServiceWarehouse.com, a Denver-based foodservice equipment and supplies dealership, has purchased the assets of Loubat Equipment Co. Loubat had fled for Chapter 11 bankruptcy before Foodservice Warehouse purchased the assets of the New Orleans dealership. Exact terms of the deal were not disclosed. Three of the four Loubat principals — Henri Louapre, Doug Tyler and Cam McCall — will make the transition to Foodservice Warehouse. "We have established it as the Loubat Division of Foodservice Warehouse," said Kristofer Bain, vice president for Foodservice Warehouse. "We don't want to lose the Loubat name and all of the history and tradition it stands for. These gentlemen were the heart of the organization and we want to take the best of what Loubat stands for, that personalized service and knowledge of the market, and marry it with the buying power of Foodservice Warehouse." This deal brings together two businesses with different models. "Foodservice Warehouse started out as an internet-only business but we have evolved over the past two to three years," Bain said. "We added a national accounts division, we do some chain work and even smallwares." Foodservice Warehouse also has two distribution centers — one in Denver and another in Kansas City, Mo. In contrast, Loubat has been synonymous with the New Orleans market for years. For 2012, the company reported commercial operators accounted for 74 percent of its business, according to data Loubat offcials submitted for ' 2013 Distribution Giants Study. Independent restaurant operators accounted for 91 percent of the company's commercial foodservice business. Loubat reported annual sales of $5 million for 2012. 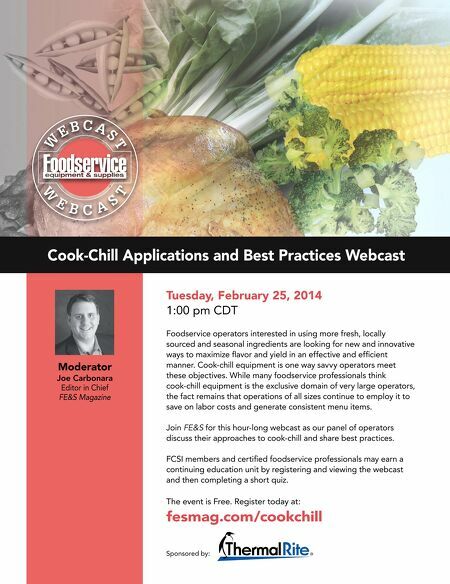 Both organizations knew each other well through their ties to foodservice equipment and supplies buying group Pride Marketing and Procurement. Loubat was the group's frst member, according to Bain. And Pride owns Foodservice Warehouse. But it was the fact that both organizations were so different in their go-to-market approach that made the deal attractive to Foodservice Warehouse. "Looking at our evolution in recent years, we felt this was the right opportunity to jump into the local design market and develop a great business model," Bain says. "It was a very attractive opportunity to take what this industry stands for, in terms of design, contract services, local relationships, etc. and marry it with what we are known for, which is really technology and customer experience," Bain added. "Foodservice Warehouse really prides itself on being very innovative in our space. We focus a lot on customer experience. We quick ship and can fulfll orders almost with an Amazon-like experience." people & events Corner Bakery Touches Down in Atlanta Airport To help propel its growth, Corner Bakery Cafe is targeting non-tra- ditional locations, like the three restaurants the chain opened in- side Atlanta's Hartsfeld-Jackson Atlanta International Airport. The main restaurant in Terminal T occupies 1,500 square feet. The two kiosk locations serve Terminal D and Terminal T.